I have read a few negative comments about Lisey’s Story. I am one for making up my own mind about things though, and I have never been disappointed by anything written by Stephen King. I was not disappointed this time either. I loved it—all 667 pages of it. Since any book is really just a big box of words, I will start this review with a few words that come into my head when I think of Lisey’s Story: beautiful, magical, sad, and impatient. Beautiful: Lisey’s Story is a beautiful story, beautifully written. It is the story of a writer’s widow. Scott Landon was the writer and little Lisey was the wife who shared the good times with him. And the bad. It is easy to share good times, but often it is the willingness to share the bad times that speaks the most about how strong a love is. Theirs was a strong love and Lisey has many good memories of Scott. Obviously, there are a few bad ones too, and also some memories that she has hidden from even herself. When trouble comes a knocking at Lisey’s door though, her very survival depends on her drawing back the curtain that she has pulled across all of the ‘bad gunky’ in her mind. While Lisey is dealing with her problems in the present day, and perhaps, taking little peeks behind the curtain, her memories introduce the reader to her husband, Scott, and gradually build up a picture of their history and life together. There are also little hints, right from the beginning, that there was more to Scott than it appeared and that he was somewhat haunted by his past. The real beauty in Lisey’s Story comes from the relationships that are detailed within the story: Lisey and Scott, Lisey and her sisters, and also the relationship between Scott and his wife’s sisters. Amanda in Particular. Of Lisey’s sisters, it is Amanda who features most prominently in the story. 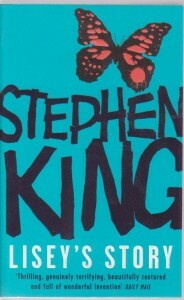 Magical: As is often the case with King, his imagination takes the reader to some magical places, where the intense and strange beauty of the surroundings has its flip side in the equally intense and strange dangers present. And Lisey faces more than her fair share of danger before the final page of her story. Sad: Lisey’s story is a sad one because, from the very first page, the reader is aware that she is a widow. It is a story of a love that is lost. Death is the final curtain, there is no denying it and when I reached the final page of the book and closed it for the last time, that is the main feeling that I felt: sad. Sad to leave the story and sad that Lisey’s love was lost, except in memory. Impatient: As the curtain moved, a little at a time, new mysteries were uncovered and I was impatient to find the answers to them. By the time that I did find the answers, another mystery had been revealed. At the beginning of Lisey’s Story certain words and phrases are introduced to the reader. Like ‘SOWISA’ and ‘bool’, for instance, and even ‘blood-bool’. These are words that belonged to Scott and Lisey alone. They were their words, and it took me a little while to understand what they meant. Especially ‘bool’ because it seemed to be a very versatile word that could be used in many contexts. I was patient and in the end I grew to understand these strange new words. I find ‘bool’ to be a pretty fun word actually: ‘Bool! The end!’ If you read the book you might agree with me on that one. Then again, you might not. I think sometimes, though, that readers can be a little impatient, and want to know everything at once instead of waiting for the answers to be revealed. Perhaps that is why I have read so many negative things about the book. I even saw a post on a forum where a reader had started the book and wanted to know whether or not it is worth finishing. I didn’t know the answer to that one at the time, but I do now. Lisey’s Story is definitely worth reading, and finishing too.